Jessie & John are a dynamic, fun, and bold couple! Ever since I got the chance to photograph their beautiful beach engagement session at Old San Juan, I fell in love with J&J. 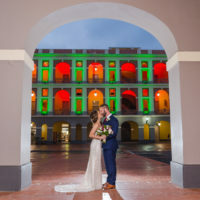 So I was SO excited their wedding day had finally arrived at the forever-gorgeous Hacienda Siesta Alegre at Río Grande, Puerto Rico. After I arrived to the Hacienda and took a short stroll to see how everything was going on, I met Jessie and her bridesmaids, they were getting ready at the bridal suite of the venue. Since they weren’t finished with their hair and makeup, I started off photographing all the little details that made their day quite special. Loved the shabby chic details on this one! While the girls finished getting ready, I quickly walked onto the library room of the Hacienda, where John was finishing up his preparation with the groomsmen. I snapped a few pictures of them before heading back to the girls. Did I tell you how much I LOVED Jessie’s bridal look?!?! After a short bridal photo session, I rushed to the ceremony area, where everyone was ready to start. Loved these pictures of Jessie walking down the aisle. The Hacienda is such a beautiful backdrop for ceremony pictures… and the sunset really helped with a beautiful golden glow. Jessie & John made two special rituals in their wedding ceremony: they did the love knot and the butterfly release. Loved the shabby chic wedding decor Creating Weddings Group did in the reception area. And THAT naked cake by Bliss Catering Puerto Rico, I still daydream about it. We were all very excited with the surprise arrival of Pleneros del Mas Allá, who gave a stunning performance of Bomba (a native afro-Puerto Rican dance), and also gave Bomba lessons for the guests. I wish you two the best of the futures together, with many blessings, laughs, health and love. I hope to have you in front of my lens again! Preparation, Ceremony & Reception Venue: Hacienda Siesta Alegre, Río Grande, Puerto Rico, Caribbean. Wedding Planner & Decorator: Maribel Ramírez, for Creating Weddings Group. Cake Artist: Bliss Catering, Inc.